This is what’s for lunch today. After making too much rice for dinner last night I put together a little fried rice. Super easy and delicious! This even makes a very nice light dinner. Often we enjoy a nice bowl of rice with various fresh toppings for dinner. Using medium high heat, heat the olive oil in a non-stick skillet. Add the rice and cook until heated. Beat an egg in a small bowl and pour it on top of the rice. Move the rice around with a spatula until the egg is cooked. Add the cilantro and a pinch of salt. Scoop the rice into a serving bowl. Squeeze a little lime on top and add the avocado. Finish off with a sprinkling of paprika. 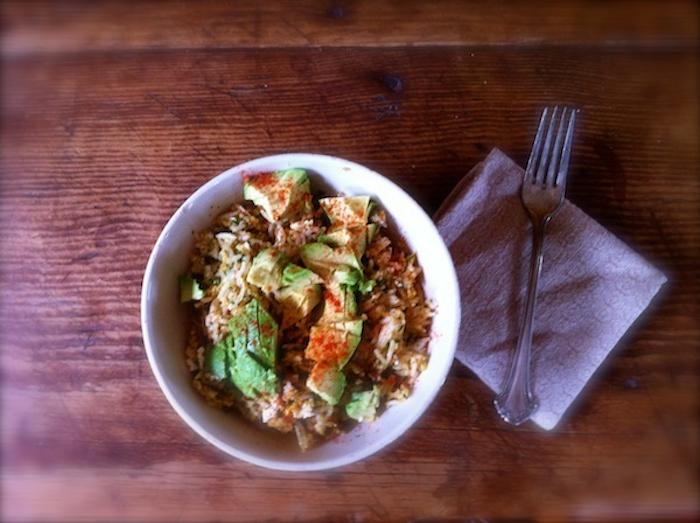 You are currently reading fried rice with avocado at COTTAGE GROVE HOUSE.